Built in 1915-1917 as “Oak Cliff High School,” W.H. Adamson High School was renamed in 1935 in honor of W. H. Adamson, who had been principal at the original and current high school for 31 years. Additions to the school were made in 1919, 1938, 1955 and 2005. In 2008, Dallas Independent School District (ISD) called for a “replacement school” for W.H. Adamson in their Bond Program, passed by Dallas voters. The school required updating for technology and to correct deficiencies due to maintenance challenges over the years. The new $40 million facility will replace the existing W.H. Adamson High School. The new building will be built adjacent to the current campus, one of the oldest school buildings in Dallas and recently designated an historical landmark by the Dallas City Council and also added to the National Register of Historic Places. Project work includes construction of the new 223,000-square-foot high school and 6,000-square-foot Industrial Technology building, renovation of an existing classroom wing and construction of sports facilities to include a baseball and softball complex, tennis courts, outdoor basketball court and soccer field. As part of the 2008 Bond Program, the Dallas ISD committed to incorporating environmentally sustainable practices with new schools as well as renovation projects. Sustainable schools are designed and built according to a code of environmental standards developed by the Texas Collaborative for High Performance Schools. The standards require the incorporation of energy efficiency, conservation and design features that foster responsible use of resources. Evidence suggests that high-performance, sustainable schools increase student performance, foster a sense of community, improve student and staff health, reduce environmental impact and lower operating expenses. At Adamson High School, the addition of the new buildings and parking lots - combined with an undersized existing city main - required detaining the additional runoff. 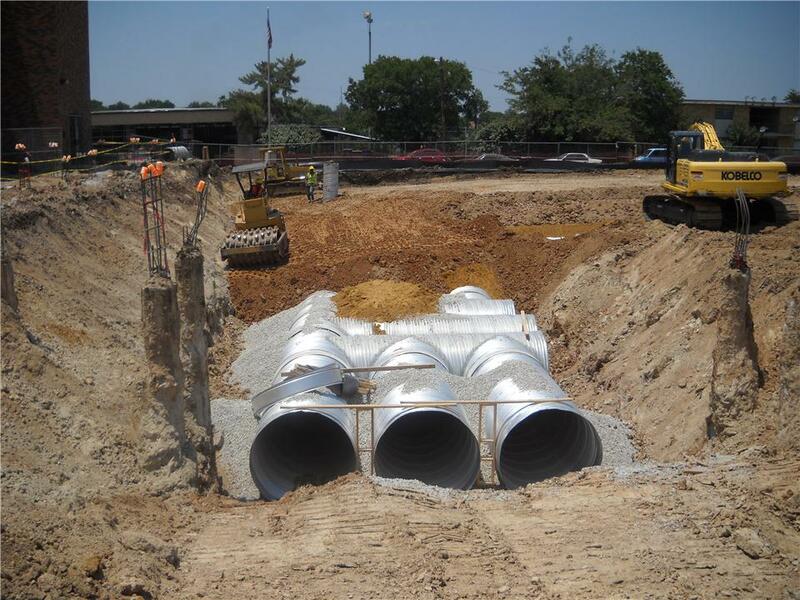 Various stormwater detention systems were considered during the planning stages. There were a few site challenges, including limited available space due to existing utilities, site layout and a minimum spacing requirement of one foot between the barrels. The underground system also needed to have capacity to store a large amount of runoff - approximately 80,000 cubic feet. Coordination of delivery was also critical because Summer school was in session. Dallas ISD worked with Pacheco Koch Consulting Engineers, Inc. to find the perfect solution. An ALUMINIZED Steel Type 2 underground detention system from Contech Engineered Solutions was selected due to its flexibility and maximum storage capacity. It was also the most economical solution. As general contractor Satterfield & Pontikes Construction, Inc., coordinated the work through subcontractor; Wright Construction performed the actual installation of the system: a 3,136 linear foot complex layout, consisting of 53 units, each 72” in diameter and 3” x 1” corrugation. The installation went smoothly and was completed on time. Construction continues, and the new school is scheduled to open in August 2012. 3,136 ft of 72” dia.